"These photos show blatant disregard to humanity. We do not know the authenticity of these photographs. However this makes the case stronger for an impartial independent international investigation into alleged war crimes and crimes against humanity"
(October 20, London, Sri Lanka Guardian) The Lanka News Web, the UK based web site has obtained exclusive photos which clearly show men with hands tied behind their back being taken by armed men in military uniform. As the uniformed men can clearly be identifiable in these photographs and others which haven't been published, Rights Groups are to demand the government to act to maintain credibility. 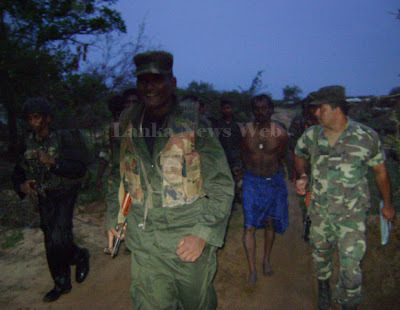 They say the government should get their Army Commander to verify whether these are serving soldiers and conduct a transparent inquiry to find out what happened to these men who appear to be Tamils who have surrendered to the Army on 18 May 2009 early morning. Tamil Groups are requesting their community to identify the men in the photo whose hands are tied. They want relatives to contact them. Global Tamil Forum has stated that that they have many more photos which will likely to implicate many senior and some serving military officers. One senior GTF source told our correspondent that "the Sri Lankan Foreign Minister who is on an official visit to London has apparently faltly rejected these photographs as fake to the BBC and in his speech at the IISS. I wonder how he can do that, when he hadn't even have access to them as yet? That shows blatant disregard to general governance and rule of law"
Observers believe that these mounting evidence will make it impossible for the government to resist international call for an international investigation into alleged war crimes. A senior source from the Indian establishment told our correspondent in confidence that it is just a matter of time before the regime in Sri Lanka has to give into the demand. Our correspondent believes that this latest evidence and the fact that there are more photos with officers clearly identified will send shivers in the ranks and some officers might even seek early retirement. We understand that one officer of colonel rank, two majors and many other officers could be involved in any such inquiry due to these photos being made available. Although Global Tamil Forum has clearly stated that these photos have not been authenticated, the details on the properties of the photos and the actual photos themselves appear to be originals. "The deafening silence of the international community to the alleged crimes that have been committed in Sri Lanka to say the least is disheartening and simply disgraceful. Many in our community do not know what happened to their loved ones and whether they are still living in custody or not. Some of these photos show particular disrespect to women and children. These people who alleged to have done this to our community are still occupying our land in North and East of Sri Lanka. Imagine what kinds of abuses must be still going on with impunity?" "If Government of Sri Lanka has nothing to hide, why wouldn't they at least now admit to allowing the UN to investigate If these are not sufficient evidence - including many satellite images, video footage and even some of the lucky ones who survived the ordeal and have come out of Sri Lanka and are willing to give evidence to any credible independent investigation bodies. I do not know what more a brutalised community could do. Only last week some of the international bodies, such as ICG, HRW and Amnesty issued a joint statement that the Commission appointed by the President of Sri Lanka lacks basic requirements to meet international standards. The UN Secretary General should at least act now and demand for an international investigation, failing, would I fear result in people's faith in such international systems, bodies and his own ability to be an impartial leader will erode away, if it hasn't already"
British Tamils demonstrated outside the IISS (Institute of International Strategic Studies) in London demanding an international independent investigation into the alleged war crimes and crimes against humanity in Sri Lanka when Sri Lanka's Foreign Minister G.L.Peris delivered a speech on how successful Sri Lanka has been in eradicating terrorism and progressing with redevelopment and reconstruction. "I am sure our Foreign Secretary Rt. Hon. William Hague will be raising serious concerns and demanding for a proper and thorough independent investigation into alleged war crimes with these new evidence along with the rest which have been shared with the international organisations. The new Coalition Foreign Policy I am told is based on respecting human rights as primary objective. We are encouraged by the Foreign and Commonwealth Office's quote that was published both in the Daily Telegraph and The Times yesterday. We are pleased that the Foreign Secretary will be demanding from the visiting Foreign Minister that only an independent, credible and transparent investigation into alleged war crimes will facilitate a sustainable reconciliation." "Along with all in my community in Britain and around the world, we believe that only an independent and international investigation can inspire confidence and achieve reconciliation. This is because, as the US Congress members noted, Sri Lanka’s past efforts to investigate severe human rights abuses have not been successful and inspire no confidence that new internal investigations will be credible. These concerns are supported by numerous reputable institutions around the world."